One of the Bronze-Age arrows. OS grid reference: SE 3910 6650. 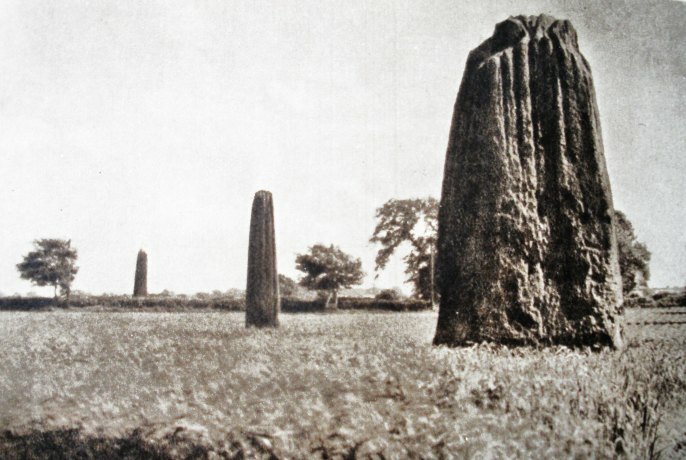 The three large standing stones, part of a stone row, are located between Bar lane and Roecliffe lane to the south-west of Boroughbridge, close to the A168 and A1(M) roads. Two of the stones stand in a farmer’s field, while the third stands in the garden of a private house 110 metres to the south. They date from the early Bronze-Age over 4,000 years ago and are now heavily worn at their tops, due probably to rain running down causing grooving or fluting in the millstone grit surfaces. It is thought the stones were quarried at Knaresborough 7 miles to the south-west. These three monoliths, also called ‘the three sisters’, are orientated north to south and stand on an almost true alignment which is 374 metres long, something that was perfected by the ancient people who lived here – the three uprights stand as a testament to the great ingenuity of their time. Another one or perhaps two stones are now lost – having quite probably been robbed away, broken up and used locally; indeed one of the stones was thought to have been used to build the 16th century bridge over the river Tutt at Aldborough. Devil’s Arrows, North Yorkshire (picture credit Sydney Tranter). 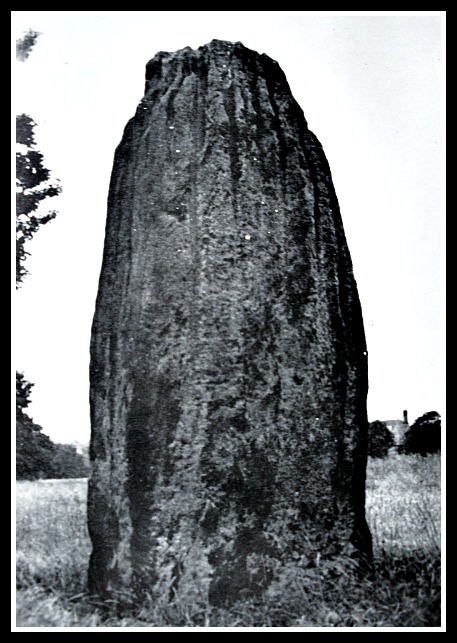 The three surviving standing stones measure between 5.4 metres and 6.8 metres high (16-22) feet high, each weighing-in at around 20-30 tonnes and buried into the ground by upto 1.5 metres. At around 5.4 metres (16 feet high) and 6.7 metres in circumference is the northern-most of the stones, while the second, central most stone 61 metres further south is 6.7 metres high and 5.4 metres in circumference, and the third stone located on the opposite side of the lane beside a private house is 6.8 metres (22 feet) in height. There are a number of crazy legends associated with the Devil’s Arrows, the most famous one being that the devil was shooting or throwing stone arrows from nearby Howe Hill at the Roman town of Aldborough, a few miles away but, much to his annoyance, he missed the target. Reputedly the devil shouted the warning “Borobrigg keep out o’way for Aldboro town I will bring down”. Another legend says the devil hung himself from the tallest stone. One legend had it that human sacrifices were placed on top of the pointed stones and left to die there, their blood flowing down the grooves. It is probable the stones were used as a kind of astronomical alignment or for sun-worshipping by Bronze-Age people. Many people visiting the stones today claim to be able to feel energy flowing out of the stones, this can be affected by hugging the stones, similar to hugging trees perhaps! Categories: Devils Arrows, Standing Stones | Tags: Standing Stones, The Devil's Arrows at Boroughbridge in North Yorkshire | Permalink.